Milwaukee catcher Jonathan Lucroy hit .280 last year, with 18 home runs and 82 RBI and will be counted on for consistent production in 2014. 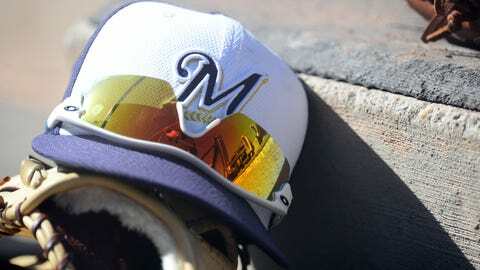 This is the third part in a nine-part series previewing the Milwaukee Brewers by position heading into Opening Day on March 31. 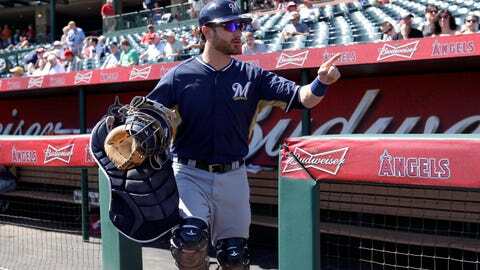 Hitting in the middle of the order for most of the season, Jonathan Lucroy continued to establish himself as one of the best catchers in baseball. Injuries to Corey Hart and Aramis Ramirez and Ryan Braun’s suspension left Lucroy as one of Milwaukee’s main run producers. Lucroy had career highs in home runs (18) and RBI (82). The 82 RBI were the most by a catcher in the majors, while his .795 OPS was fifth among backstops, trailing just Joe Mauer, Yadier Molina, Carlos Santana and Buster Posey. The Brewers needed him in the lineup so badly they had him attempt to learn first base to play when he didn’t catch. The 27-year-old has continued to improve behind the plate, but Lucroy threw out just 22 of 102 runners attempting to steal against him last year. The 21.6 caught-stealing percentage ranked Lucroy third-worst among starting catchers. He threw out 21.3 percent of base stealers in 2012, down from 28.0 percent in 2011 and 31.5 percent in 2010. StatCorner.com ranked Lucroy as the best catcher by far at saving runs by framing pitches, getting the umpire to call strikes on borderline pitches. Maldonado was 10th in the rankings done by the website. Maldonado couldn’t duplicate the offensive success he had in 2012, but the 27-year-old’s value as a backup catcher comes from his defensive ability. He committed just one error in 366 2/3 innings behind the plate in 2013 and threw out 29.6 percent of attempted base stealers. Maldonado only had 27 runners try and steal against him in 47 games in 2013 and has only allowed 51 stolen bases in 907 career innings at catcher. After hitting .266 with eight home runs and 30 RBI over 78 games in 2012, Maldonado hit just .169 with four home runs last season. He’s probably isn’t ever going to hit .266 again but also isn’t as bad of a hitter as he was a year ago. The Brewers are set at catcher for a number of years, as Lucroy is one of the biggest bargains in the league. He’s set to make $2 million in 2014, $3 million in 2015 and $4 million in 2016 before a the team has a $5.25 million option in 2017. Lucroy not only has become one of the best at his position with the bat, but he’s also one of the leaders in Milwaukee’s clubhouse. To become one of the best all-around catchers, Lucroy must improve defensively. He believes he’s been gripping the ball like a changeup, obviously preventing the throw from having the necessary velocity. There’s little question what he can do with the bat. He will likely hit fifth or sixth in the lineup and will have much more around him than he did for most of last season. The return of Braun and Ramirez will only help Lucroy’s offensive numbers. Although Molina and Posey are hard to beat out, Lucroy certainly has the ability to find his way onto the National League All-Star team. The Brewers don’t need Maldonado to be a force offensively. His ability to call a game, eliminate the running game with his arm and handle Latin pitchers like Wily Peralta makes up for what he lacks with the bat. Stay healthy. The Brewers need Lucroy in the lineup and can’t afford to lose him for an extended period of time. He’ll produce if he’s healthy. Maldonado is fine in a backup role, but he just doesn’t hit well enough to play every day.